Lavender (Lavendula vera, D.C.; L. Angustifolia, Moench. ; L. spica, Linn.) is a half-hardy perennial herb, native of dry, calcareous uplands in southern Europe. Its name is derived from the Latin word Lavo, to wash, a distillation of the flowers being anciently used in perfuming water for washing the body. The plant forms a compact clump 2 to 2 1/2 feet tall, has numerous erect stems, bearing small, linear, gray leaves, above which the slender, square, flower stems arise. The small violet-blue flowers are arranged in a short, terminal spike, and are followed by little brown, oblong, shiny seeds, with white dots at the ends, attached to the plant. The seeds remain viable for about five years. 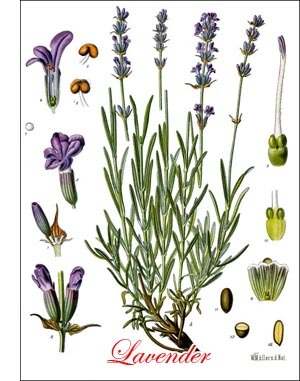 Lavender succeeds best on light, limy or chalky soil, but will do well in any good loam. In gardens it is usually employed as an edging for flower beds, and is most frequently propagated by division or cuttings, seed being used only to get a start where plants cannot be secured in the other ways mentioned. In cold climates the plants must either be protected or removed to a greenhouse, or at least a cold frame, which can be covered in severe weather. The seed is sown indoors during March, and if crowding, pricked out 2 inches asunder. When the ground has become warm, the plants are set in the open 15 to 20 inches asunder. It delights in a sunny situation, and is most fragrant on poor soil. Rich soil makes the plant larger but the flowers poorer in perfume. The plant is sometimes grown for a condiment and an addition to salads, dressings, etc., but its chief use is in perfumery, the flowers being gathered and either dried for use in sachet bags or distilled for their content of oil. In former years no girl was supposed to be ready for marriage until, with her own hands, she had made her own linen and stored it with lavender. And in some sections the lavender is still used, though the linen is nowadays purchased. In southern France and in England considerable areas are devoted to lavender for the perfumery business. The flower stems are cut in August, covered at once with bast matting to protect them from the sun and taken to the stills to obtain the thin, pale yellow, fragrant oil. Four-year-old plants yield the greatest amount of oil, but the product is greater from a two-year plantation than from an older one, the plants then being most vigorous. Two grades of oil are made, the best being used for lavender water, the poorer for soap making. In a good season about one pound of oil is obtained from 150 to 200 pounds of the cut plants.